Title: Australians at War in the Sudan 1885 THE REHEARSAL by K S Inglis. The 700-man contingent to Africa after Gordon's death. Author: K S Inglis, Professor of History at the Australian National University. Condition:Crisp red card-bound illustrated hardcover with title to both spine & cover, no inscriptions, TIGHT, STRAIGHT & CLEAN in GOOD plus CONDITION inan unclipped GOOD DUSTJACKET with minor rubbing and edgewear, and a small closed tear at the rear. 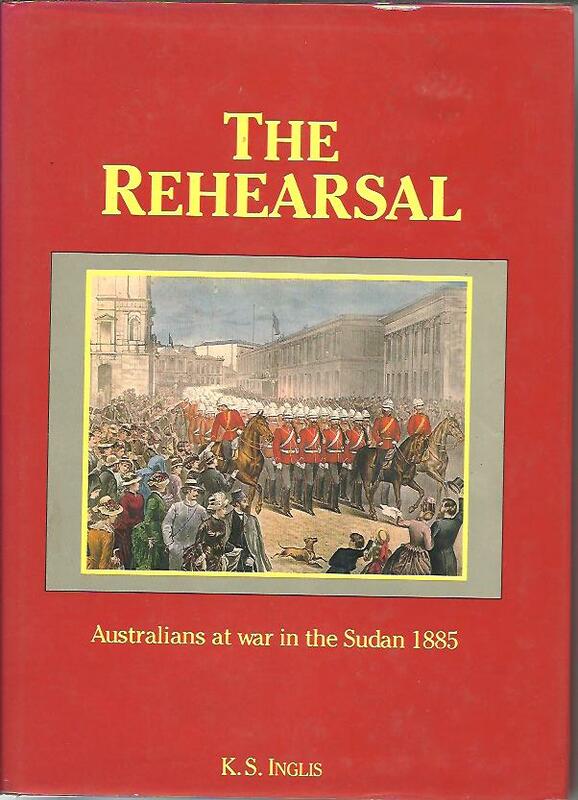 Description: A very well-illustrated account of a rare Australian incursion in Africa.The book tells of how the 700-man Sudan contingent was formed, how its members fared at the war, and how their experience was interpreted by politicians, writers, photograhers. Author: written by members of the Volunteer Defence Corps and published for them by the Australian War Memorial, Canberra as one of the WWII series. Publisher: The Australian War Memorial, Canberra, ACT 1944 FIRST EDITION hardcover quarto with dj, 172 pages, articles, coloured plates, illustrations, cartoons, illust enprs. Condition:Crisp cloth-bound grey hardcover with a bright red title to spine & front cover, no inscriptions, vslight age-toning to ROBUST pages, STRAIGHT, TIGHT & CLEAN in VERY GOOD CONDITION in a damaged but intact GOOD MINUS DUSTJACKET with tears esp at spine. 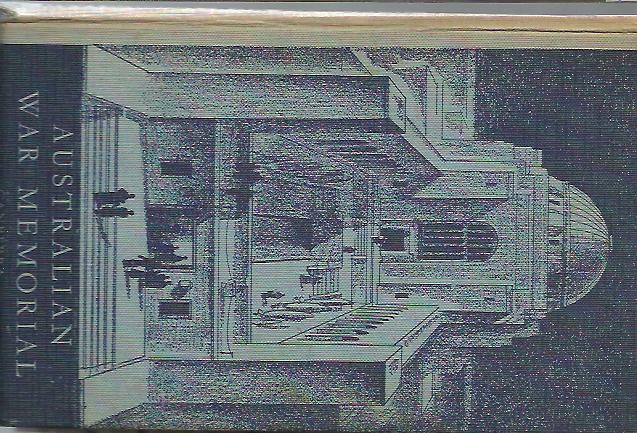 Description: The scarce VDC edition with an ever scarcer dustjacket. From the series published by the Australian War Memorial to remind & inspire WWII veterans and their families. Includes articles and artwork by members, who are only identified by their Service No. 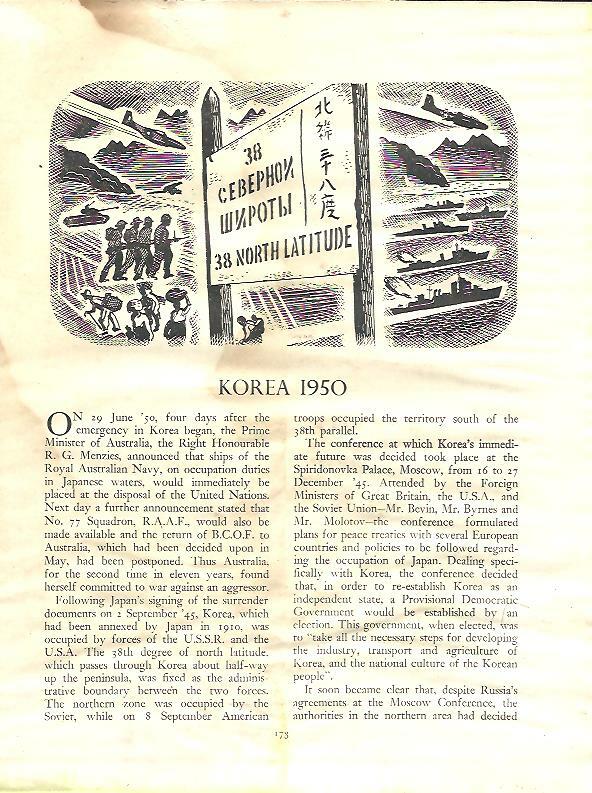 Publisher: published looseleaf by the Australian War Memorial 1950 from information and material from RAN and RAAF sources. 16 Pages unbound. Publisher: University Study Group on Vietnam, 48 Milling St., Gladesville, NSW. Paperback 8vo, 150 pages, 3 parts,10 chapters, facsimile documents,speeches, chronology, index. Condition:Crisp paperback, STRAIGHT, TIGHT & CLEAN in VERY GOOD CONDITION with no inscriptions. 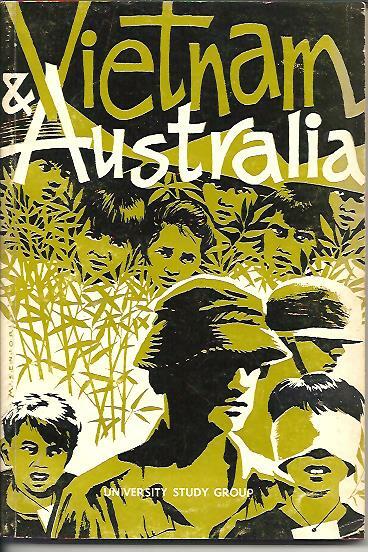 Description: Pre-history, The French colony, History of Vietnam, The Geneva Conference 1954,The National Liberation Front, Escalation of war, Australia's commitment, Historical documents, interpretations by Rt. Hon. Paul Hasluck, Hon A. Calwell and Mr Gregory Clarke. Author: issued by the Australian War Memorial, Canberra, 1955. Condition:Printed blue hardcover with title to spine, no inscriptions, STRAIGHT, TIGHT & CLEAN in GOOD CONDITION with very minor cover-wear. The fold-out plan is intact . Description: The Assembly;l The Hall of Memory; The Naval Galleries; Gallipoli; Palestine; The Aeroplane Hall; Medical; France & Belgium; Uniforms and Trophies (Menin Gate); France; 1939-1945; The Gun Galleries; Heavy Armaments and Tank Gallery. Condition:Very large 814 page softcover, STRAIGHT & TIGHT in GOOD CONDITION without a dj, with an "EX-LIBRIS" name plate to the front endpaper, slight ageing to robust pages. Description: This sweeping account draws on hundreds of unpublished sources and interviews with soldiers, politicians, medical practitioners, aid providers, entertainers and the Vietnamese people to reconstruct the history of Australia in the 10-year Vietnamese War. Condition:Illustrated softcover with title to spine & front cover, very slight rubbing to spine & corners, CLEAN & TIGHT in GOOD CONDITION, with previous owner's name to front endpaper. 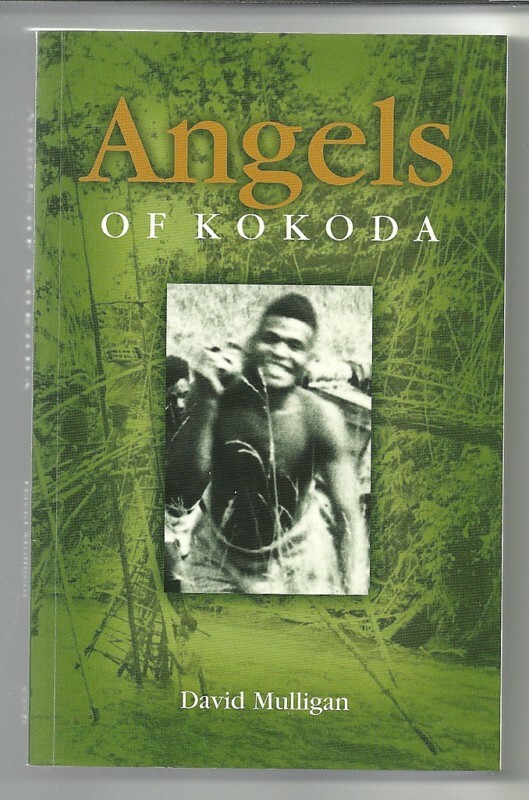 Description: This book describes the horrific experiences of the 39th Battalion on the Kokoda Track/Trail, both movingly and interestingly, as seen through the eyes of two adolescent boys - one Papuan and one Australian - who are close friends. 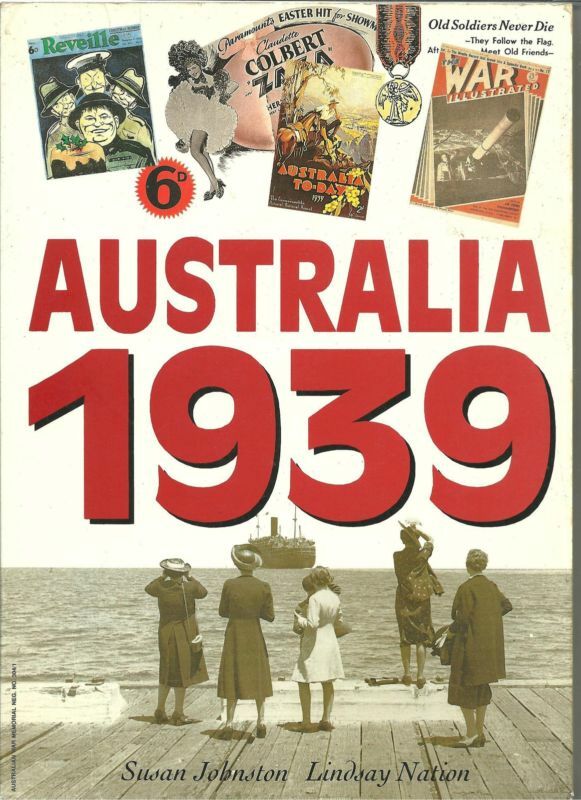 Title: WWII World War Two AUSTRALIA in 1939 by Johnston Pre-War & WW2 HISTORY PHOTOS & analysis of 1939 in Australia. Condition:Card-bound softcover , gilt title to spine & illustrated front cover, very slight rubbing to spine & corners, CLEAN & TIGHT in GOOD CONDITION with rubbing and edgewear and a few marks to page edges.